If you missed part one of my GT/Sherlock fanfic, it can be found here. I could not help but let a chuckle escape, despite our guest's obvious distress. "The cat gifs have been stolen off the Internet?" I asked, "My dear woman, what sort of nonsense is this? Do you not know who this is? This is Sherlock Holmes, the greatest mystery solver the world has ever known! I'm sure that you are quite sad that you cannot squeal and squee over cats stuck in chaise lounges any longer, but surely you must see that this is not a real problem!" Sherlock remained silent, pensively staring out the window. I was mildly surprised. Tact is not generally in his wheelhouse, so pondering how best to let this hysterical lady down seemed quite out of character. "Ms. Apples, please allow me to hail you a cab. Is there a gentleman at home who can take care of you until you are quite well?" "Watson, silence!" Sherlock barked. I was quite taken aback. He couldn't seriously be considering this woman's preposterous request to track down cat gifs, could he? "Ms. Apples, if I quite understand you, the balance of the Internet has been upset. The Internet is the primary source of communication these days, and your so-called 'High Council of Groupthink' is crucial to keeping it in balance. If the cat gifs are gone, open war will be declared by those you call 'Team Cat' and 'Team Dog,' and you will no longer be able to combat the darker sides of the Internet. It would be anarchy. Governments could no longer use it for secure communication. Anyone who ventures on will immediately be mercilessly mocked, and because humans are such frail, weak creatures who cannot understand that no one is discriminating against them particularly, it will be abandoned to the trolls." Our guest looked pained to push past this last of Sherlock's points, but she appeared to have more urgent matters on her mind. "Mr. Holmes, your white cis male privilege aside, will you help us find the cat gifs? Will you help us restore the balance of power, and prevent open war between Team Cat and Team Dog?" "Yes, yes I suppose I shall. To start, we shall have to go to America!" "Mr. Holmes! Dr. Watson! We are so happy that you have agreed to help us. Allow me to introduce us: we are Team Coalition, representing members of various Teams, and we are dedicated to preventing war between Team Cat and Team Dog. I am Erudita Vanitas, a representative of Team Cat. Many members of Team Cat believe Team Dog is behind the gif theft, but we know it is sabotage. I have tried to convince my fellow Team Cat-ites that Team Dog would never do anything so despicable, but many still feel this is a power grab." "And I am TamTams, a representative of Team Dog. Team Coalition is a secret organization, and we have been working underground for years to help keep the peace. If posts are skewing too far in one direction, we restore the balance. We know that our quarrel is not with each other, and that we have a sacred task: keeping the trolls at bay. We long ago decided to use bunnies, a neutral animal, with which to bomb the trolls, but I don't know if anything can be neutral in these dark times." "And who is this adorable critter?" I asked, suddenly taken by a young woman with a bristly creature on her shoulder. "I am RawrGlicious, and this is Spike! We represent Team Hog." "Hog? That is no even-toed ungulate! That is most certainly a member of the Erinaceinae family!" Sherlock corrected the woman. He was always the most correct person in the room, and in a room filled with women who seemed to think the disappearance of cat gifs from the Internet would shake the foundation of civilization, this was doubly true. But Sherlock was giving them credence, so I had to go along with it. "Mr. Holmes, he's a hedgehog. We often do not say full names on the Internet; such is our vernacular. He is also quite famous, and right now, one of the only creatures on the planet that can unify the High Council," the girl explained earnestly. Did she truly believe that this small creature was all that was keeping the Internet from breaking into chaos? Sherlock nodded and moved on, taking note of a gentleman in the corner, who was watching us with a somewhat bemused (or is at amused? I can never keep those straight) expression on his face. "And who is this fellow over here?" 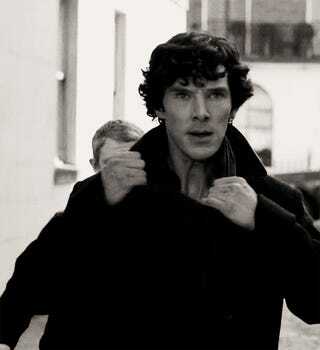 Sherlock questioned, not moving his gaze from the lad's face. He did not answer right away, and instead kept returning the stare. "They call me Ubertrout. I want to just laugh at all the ridiculous people who are freaking out thinking Team Dog is behind this, but unfortunately, these people are making Team Cat look bad with their absurdity. Team Cat is aloof, above this, better. Not these people. These people are making Team Cat look like Team Screeching Ferret." "Ubertrout, that's not the point right now. We need all of us on the same side. We also need cat gifs in our troll-combating arsenal," the one called Erudita Vanitas reprimanded. "I'm just not happy about my job. This is the REAL misandry, guys," the lad complained. Misandry? Team Hog? It was as if these youths were speaking a different language. "Oh come now, good fellow! It has always been the lot in life of men to do the work that women cannot do. Man up and accept your role! What is this task you are so dreading?" The youth positively winced: "I have to infiltrate the group most likely responsible for the gif theft: MRAs." *A special thanks to everyone who volunteered to be in this edition! The next edition will come out in a more timely fashion, providing you aren't all over this by now.